The regular monthly meeting of the SIEC will be held at our meeting location: 3948 Amboy Road, Great Kills, Staten Island, NY 10308. The entrance is on Hillside Terrace. The doors open at 5:00pm. Please bring your appetite and a new member. The SIEC is collecting dues for "2019". The dues are $30.00. Our collection period will take place from January to April. Please make every effort to pay your dues as early as possible within this period. Make your check payable to "Staten Island Electrical Club" or SIEC. Mail it to the address listed at the bottom of this page. Our weekend at Santorini will take place on Friday, October 4 through Sunday, October 6, 2019. Any active member who has not had the opportunity to stay at Santorini will have first preference. I encourage anyone who hasn't had the chance to visit, please take advantage of this excellent opportunity. Please see Eric Diez at the meeting or call him at 917.921.4897 if you are interested in attending. Please help us reach our goal by supporting the club with this raffle. Donations are $10 per ticket or $50 for 6 tickets. Please bring the ticket stubs to the meeting or place them in the mail. The drawing will take place at our July meeting. This raffle gives an opportunity to win up to $5000, if all the tickets are sold. Winners will receive 50% of all ticket sales. Proceeds from the Staten Island Club winnings will go to our annual Staten Island Scholarship Fund. As a reminder, these tickets are NOT to be sold on any jobsite. Additional tickets will be available at our monthly meetings. The Staten Island Youth Initiative meeting will take place on Monday, April 29th at 5:00pm in the SIEC office. Please encourage your mentee's, apprentices and young Journeymen to attend. See Ronnie Wuerch Jr. if you have any questions. The Notre Dame "Bread of Life" food drive will be held on Saturday, April 13 at 6:00am at the Monsignor Farrell High School, located at 2900 Amboy Rd, Staten Island, NY 10306. Please wear your Local#3 attire. If you wish to volunteer, please call the SIEC office or Tony Scutari at 917.855.8905. 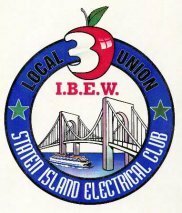 The Staten Island Electrical Club's Scholarship program for the children and grandchildren of SIEC members in good standing is in effect. The cost to join the scholarship is $300. In order for your child or grandchild to be eligible to receive the 2019 scholarship, they must currently be a High School Senior or presently attending college. You must be paid in full, including your SIEC dues and have the application submitted by June 1st. Applications will be available at this meeting. Please see Eric Diez, Vinny Perno or Marc Santigate at the meeting to answer any questions you may have or to help you with any paperwork you may need. Good luck to those eligible this year, and remember, it's never too early to start thinking about our children's future. In an effort to go green and significantly reduce the club's monthly mailing expenses, an email will be your only notification of our upcoming meetings, newsletters and events. Please check your email inbox weekly for all updated club information and happenings. If you have an email address and have not given that information to the club, please see Eric Diez so he can update our records OR send an email to our email address below (be sure to include your first and last name in the email). Thanks in advance. Click on the "Picture Gallery" link at the top of this page to see pictures of all our past SIEC events. (C) COPYRIGHT 2012 by Staten Island Electrical Club. All rights reserved. No part of this web site may be copied or reproduced without the prior written consent of the author.